The coolest little bird in the world! Nice promo Em. Will go and vote for the hihi, what a little goer he is!! There’s a piece of info that needs correcting in my video blog. It’s been bought to my attention my Dr. Isabel Castro that ‘the hihi is not a member of the Callaeidae but this is the closest existing group’. Thanks for pointing that out! Cheers Celia… thanks for voting!!! Hey that first piece on radiolive in the weekend about hihi was fab. Go hihi!! Just the grey-tufty afros belonging to the hihi’s chicks are enough to tilt the odds in favour of this bird. I can only assume that they are sitting in that circle commenting on each-other’s awsome hairdos. Always wanted to give those Big Birds a run for their money…looks like that radio opportunity on Sat has paid big dividends…and I’ve been keeping an eye on your numbers going up. Good one! 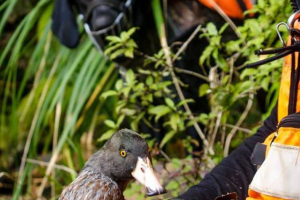 Thanks for all the support hihi lovers… I can only presume that once more NZers get to see and hear about this rare avian jewel its popularity will soar!!! So get ready to campaign for the hihi in 2010!